May 16 -- Sunday was a day of highs and lows, of new discoveries and dashed hopes. Bertrand Tavernier and Takeshi Kitano, two directors whose films I had most anticipated here, did not live up to my expectations with "The Princess of Montpensier" and "Outrage," respectively. Hungarian Agnes Kocsis, a director who had only made one previous feature in 2006, blew me away with her insightful "Adrienn Pal." Kitano's "Outrage" is a gangster film, and was rumored to be Kitano's best prospect in years for an international hit. Although Kitano has worked in many genres, he is best known in the West for gangster films including "Sonatine" and "Fireworks." In the press kit for "Outrage," Kitano makes the statement, "I have never and I will never shoot violence as if it's some kind of action video game." Oh, please. "Outrage" is a film that's exactly on the level of a mindless video game. The story, a muddled mess involving intricate yakuza rivalries so complex that it was impossible to keep track, is entirely superfluous. The writing, the acting, and the direction barely qualify as perfunctory. The whole point of this film is the violence, which is delivered with no mediating satire, sense of humor or poignancy, as has been the case with Kitano's best work. Small provocations and minor insults between gang members of the Otomo and Murase clans escalate a gang war in which every murder requires one or more murderous retaliations. Fingers are chopped off in graphic detail, a man's face is savaged with a dental drill as the weapon, and so many gang members are bludgeoned or kicked to death that I stopped counting. I'd love to see Kitano back on top in this genre, but "Outrage" isn't the film that's going to do it. If Tavernier's "The Princess of Montpensier could be described in one word, it would be "classy." 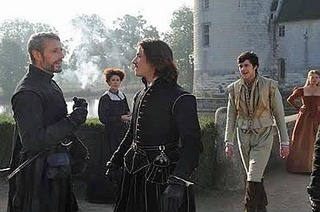 This is an historical drama set in 1562, when religious war in France between the Catholics and the Huguenots, the French Protestants, waged in fits and starts. A beautiful teenaged noblewoman, seemingly desired by and irresistible to any man who lays eyes on her, is in love with her hot-headed cousin the Duke of Guise. To make a political alliance, her father instead arranges her marriage to the bland Prince of Montpensier, who entrusts her to the care of his childhood tutor the Count of Chabannes, while he returns to the battlefield. The attention to historical accuracy in the production design of "The Princess of Montpensier" is extraordinary. The story progresses from a rural chateau to the court in Paris, as men other than her husband compete for the affections of the still-naive princess. Every frame is a feast for the eyes. The costumes, the interiors, and the depiction of the conventions of the age provide a history lesson in themselves. For instance, the wedding night of the young couple is seen to be a social affair, underlining the political import of the marriage. The newlyweds have scant privacy behind the bed curtains, as relatives and courtiers feast at a buffet at the foot of the bed, and the two fathers bond over a chessboard just feet away, while waiting for the woman's outcry, and for the bloodstained sheet to be displayed by ladies in waiting. Given all that, why was I disappointed in this film? The reason is that I expect so much more than just a beautiful, classy film from a seasoned director like Bertrand Tavernier. This is his 35th film, and I know from his past work, even going back as far as films like "Coup de Torchon" and "'Round Midnight," that he is capable of bringing more bite, more emotion, and more revelation to his work. In the first few minutes of "Pal Adrienn" by Agnes Kocsis, I feared that this was to be a grim cinema verite film focusing on the daily routine of a hospital worker. We are introduced to Piroska, a severely overweight nurse who cares for the dying in a terminal ward, and whose duties include transporting the bodies to the morgue. She is seen constantly snacking on pastries she keeps at her post in front of a bank of heart monitors, and on half-eaten sandwiches she keeps in her pocket. At home, Piroska has a live-in boyfriend, who nags her constantly about her weight, interrogates her on her diet, and suspiciously checks the mileage on her exercise bike. Her reaction behind his back is to grab every bit of food she can. One day, the name of one of Piroska's just-deceased patients reminds her of the name of her childhood best friend Adrienn Pal. She embarks on an increasingly obsessive search for this friend, who moved away when they were both in the fourth grade. In fact, the search takes over her life. This is a film that sneaks up on you, going from doubtful to gripping. Piroska is an increasingly likeable character in her modesty, persistence, and her poignant nostalgia for what she recalls as the one true friendship of her life. She searches out her elementary school classmates and teachers and discovers the faulty nature of memory: Adrienn was a "bad girl"; she was someone else's best friend; she was ill and left school; she was in a different class; she didn't exist. The conflicting stories pile up, yet Piroska follows every clue. With enormous subtlety, director Kocsis leads the way through this maze, demanding patience from her audience, and yet rewarding it as Piroska's search comes to an end. Kocsis does not reach for the easy out of a conventional happy ending, but instead reveals Piroska's new insight into her life and intimates the possibility of change, leaving her viewer's glowing with that hope.